Rachel! With her guess of Aug. 22! Baby has an “official” birthday of Aug. 21. Thank you to readers/guessers Zacharias and Maria, who were very close! If I’d been more organized, I’d have set up a photo to use with this post – but I have numerous pix of this girl to post later … and many future visits. Rachel, can’t wait to hear what you come up with as a name for Kootenai’s gorgeous baby girl! No pressure! 🙂 And your calendar will come to you toward the end of the year! Update: I decided that I couldn’t let Zacharias walk away empty-handed after his also-excellent guess, so I offered him a calendar, too. And yes, I’m definitely planning to hold another vote about calendar images this year – hopefully earlier so I can get them done and out earlier! Really, I’m thrilled with their guesses (especially because I originally thought “no way she’ll foal that early!”) – and with Maria’s Aug. 24 guess, too. 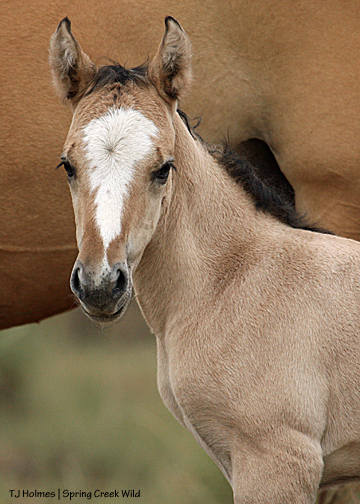 I’ll have to figure out something for Maria – maybe a print of Kootenai’s filly. September-guessers – I would have been with you! Until I saw Kootenai on Aug. 19, I thought for sure she was going to head right into September before she shared her baby! Baby girl in that soft little red glow that lasted just minutes. … And yes, I think she’ll stay dun. I don’t think this girl is destined to go grey. Notice Kootenai’s legs – she has the stripes, with that lovely “webby” sort of pattern, but they’re darker “orange” than the rest of her body coat, not dark or black, like Hollywood’s are. Sorry about the recent quiet … I’m trying to get this ID book finished and trying not to get sidetracked! 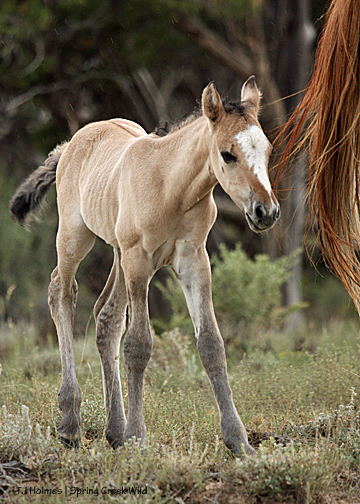 About Kootenai’s filly – I basically have no consensus about her birth date, not even from the vet, other than she was probably born between about Aug. 20 and Aug. 22, so I’m going to “decide” that she was born Aug. 21 and have a drawing between those closest dates: Aug. 20 and Aug. 22. (Can you believe folks were so close! And that doesn’t even mention the guess of Aug. 24, which was the day I found her.) I’ll do that today with my trusted co-worker who pulled the name out for the calendar around Christmas. Zacharias (Aug. 20) and Rachel (Aug. 22): Good luck to each of you, and many thanks for your guesses!! This handsome little devil is Cougar, son of Iya and Hollywood. Iya and Cougar are with Poco and Roach (have been for quite a while now). I’ll have more of this awesome boy … I really should be doing other things, like working on the ID booklet for BLM! Who is this beautiful girl? “Just another bay mare” … This is our lovely young lady Liberty! Right now, I’m pretty sure she’s NOT about-to-drop pregnant, unless she’s really aiming late (and not a drop of PZP-22 has she received, just so you all know). She very likely IS pregnant … hopefully for next spring. She was looking at Hook’s band, the members of which weren’t too far away. What, you thought I could post without slipping in another shot of this little lovely?! Is it me, or does she look like a pronghorn antelope with her wide-set ears and big eyes, with those little stripes above them? I have gotten some ideas about her birthday, but I’m still waiting for the vet’s “official” call … glad for your patience! 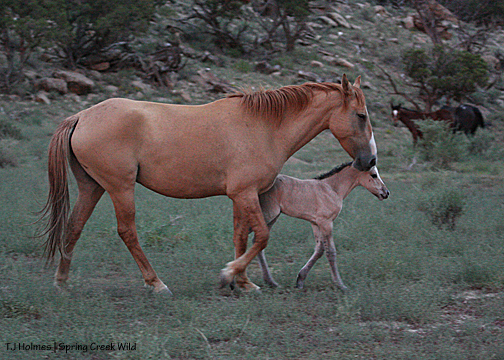 With the Spring Creek Basin roundup just about three weeks away, the time has come to address with more in-depth explanations what’s coming with regard to the Spring Creek Basin roundup. Along the same lines, I’d sure like to start discussions about what YOU are most interested in knowing. What are your concerns, fears, apprehensions regarding this roundup? I will answer as fully and candidly as possible – based on my knowledge. I can yak about things I *think* you’re interested in … but if you have something specific, please do ask. If I get enough questions, I may do a specific post, addressing each question, rather than leaving them in the comments sections. My email – if you would rather not leave a public comment – is mtbgrrl (at) fone (dot) net. * I feel the need to explain this again: Because of the size of Spring Creek Basin (slightly less than 22,000 acres of high desert), it cannot support a population that is considered by many to be genetically viable on its own. 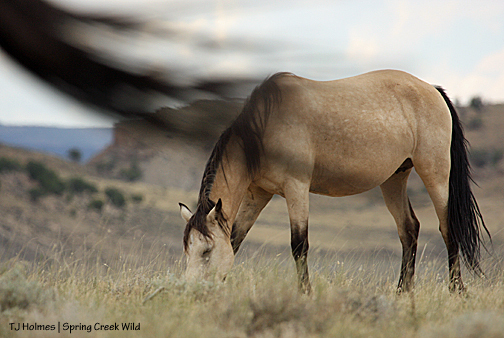 Please don’t get carried away with some “certain” number that would make the Spring Creek Basin herd viable. The finite nature of the herd management area – and its water and forage resources – makes a population other than what the basin can physically support a moot point. To achieve that balance and maintain both herd and range health, this roundup and the removal of some horses is necessary. * Because I will be working with BLM does not mean I am in full agreement with all its policies and/or procedures. In fact, quite a bit of the status quo that CAN be changed is what I am working very hard TO change. But we must work within the bounds of reality, and with that in mind, we have accomplished quite a bit here. 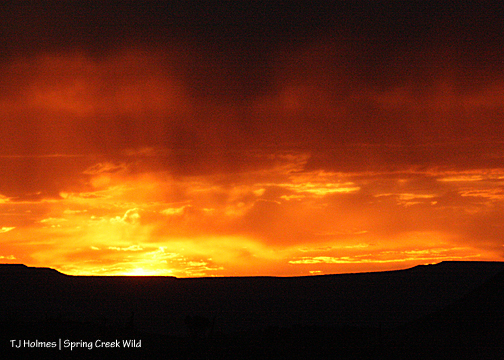 Follow this link to get to a PDF map of Spring Creek Basin Herd Management Area. Warning: It takes an obnoxiously long time to download – and I’m on a high-speed connection. Then, when it was “done,” it was black. I clicked the + button at the top to bring it into view. The blue line denotes the boundary of Spring Creek Basin, and the G at the western edge denotes the location of the trapsite. So let’s talk about the roundup. As a representative member of Disappointment Wild Bunch Partners and president of the Colorado chapter of the National Mustang Association, I will be involved with BLM during the roundup. As documenter of the herd, with specific knowledge of the horses, I will be intimately involved. This is not precedent-setting; it happens with at least three other herds I know of. It’s one of the things that most impressed me before I started documenting the Spring Creek Basin herd – and why I realized I had to make it happen here. What it means is that I will be at the pens the entire time, attached at the hip, so to speak, to Jim Dollerschell, manager of the Little Book Cliffs herd, who will be at our roundup in the capacity of “contracting officer.” What that means in practical terms is that Jim has lots of experience, and Spring Creek Basin does not have a herd manager at present (though it is hoped one will be hired by the time of the roundup). 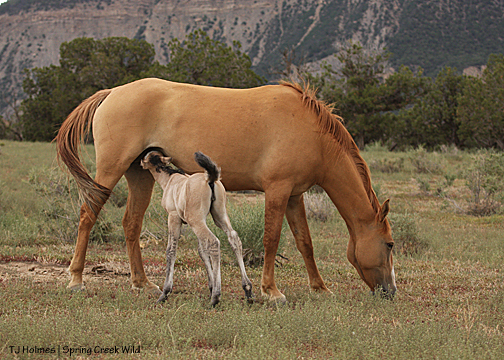 Because of Jim’s specific experience as manager of the Little Book Cliffs herd – using native PZP successfully (their roundup this fall was canceled, remember) and working with an active and dedicated advocacy group (Friends of the Mustangs) – I am extremely grateful to be working with him, in particular. My main duty will be to advise BLM about the identities of each horse captured, as well as advising BLM – and, in turn, the helicopter pilot, with whom Jim will be in contact via radio – of the identities of horses on the range, especially as it comes to bands that should NOT be targeted for roundup. Specifically, two of those bands will be Kreacher’s and Seven’s, which include Raven and Kootenai (in Kreacher’s band), and Mona (in Seven’s). The reasons here are two-fold: 1) Raven, Kootenai and Mona were introduced in 2008 for their genetics, needed in Spring Creek Basin to keep our own genetics strong. 2) Kootenai just had her foal, and Mona is due to foal Sept. 15, the day the roundup is scheduled to start. 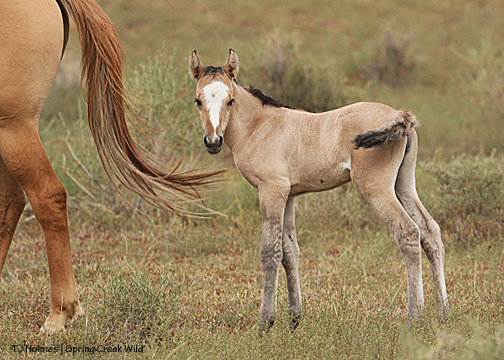 Beyond even what BLM says, it would, indeed, be a “PR nightmare” for very young foals to be killed during the roundup – especially when they’re *known. * The third band will be Ty’s, which includes yearling Puzzle and her dam, Chipeta, who is due to foal Sept. 1. Some specifics here via what we learned at our meeting yesterday (Aug. 24): The horses to be released (including mares, who will get the PZP primer) will most likely be set free as soon as it is determined the roundup is over and no more horses will be captured. The roundup is scheduled to start Thursday, Sept. 15. Expectations are that it will last no more than a couple of days, but, of course, this is subject to on-the-ground realities such as weather conditions. Horses not going to adoption may be loaded onto trailers bound for Canon City by Saturday (Sept. 17), and the horses bound for adoption will be hauled to the fairgrounds Sunday (Sept. 18). I understand that’s because that is the soonest date the Montezuma County Fairgrounds will be available for them. The training demonstration by Ems Rapp and her Spring Creek Basin mustang, Rock On, will be held from 5 to 7 p.m. Friday, Sept. 23, with the adoption scheduled Sept. 24. The adoption details will be outlined in a separate post. The contractor – Cattoor, same as in 2007 – is expected to arrive in Spring Creek Basin on Wednesday, Sept. 14, to set up, and the roundup is expected to start Thursday, Sept. 15. It is scheduled through Sept. 18, but it may or may not last that long, as noted above. BLM says about 10 horses likely will be released, but that number will depend entirely on the number of horses rounded up and the number left in the basin (not rounded up). We also have not specifically addressed how many horses will be left in the basin post-roundup. 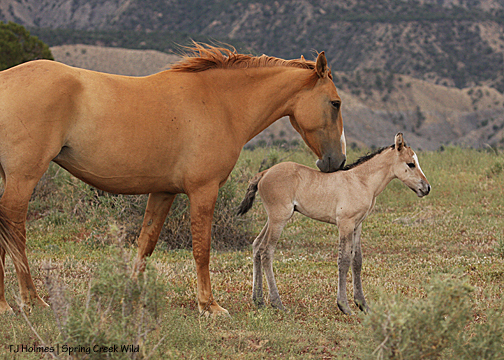 The low end of the AML is 35, but 43 were left in 2007 (unknown to BLM; the manager at the time thought 37 horses were left). 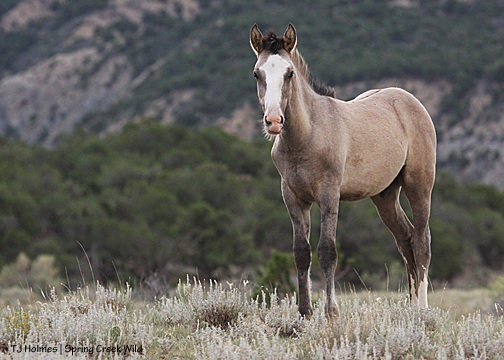 We hope to use this precedent – as well as logic such as the use of PZP (with documented efficacy of at least 90 percent), no planned introductions of horses and the gender skewing – to leave at least this many horses after this roundup. We also have repeatedly asked that the contractors give the horses time to settle in the first pen at the trapsite instead of being choused by the contractor’s cowboys using plastic bags on the ends of whips/sticks after the horses have just been run for miles and captured in pens and are then sent immediately into the chute for “processing.” Again, no promises have been made here – other than they will bring it up to the contractor. However, I believe this is behavior that should not be tolerated unless it is specifically warranted in a specific situation. 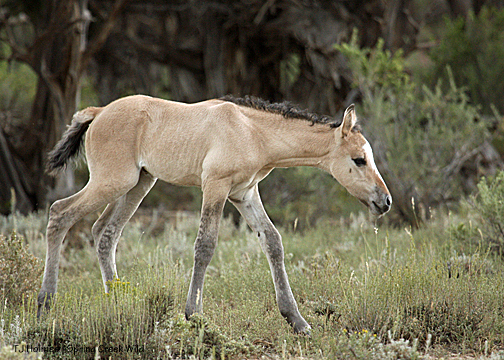 Wild horses – like other wild animals – move away from pressure, a human being a great pressure. Example: At the last Little Book Cliffs roundup (also in 2007, just a few weeks after ours), only once did the volunteers need to use a plastic bag. Two very small bands came in together – as I recall, a stallion with one mare and a stallion with two mares (with a foal or yearling?). In the close confines of the alley leading to the pens, the bag was used to separate the stallions – then immediately put away. Yelling and screaming and waving those things in the faces of wild horses that have just been on a terrifying run ahead of a helicopter and then penned with no way out is NOT the time to use it. We reiterated this plea at our meeting yesterday and will continue to do so. Now, about the “selection process,” the thought that prompted this post in the first place (much of this is pre-typed (though, I admit, oft-edited); I was waiting for information from yesterday’s meeting to post it). I want to emphasize here that this is MY philosophy, and based on MY knowledge of the Spring Creek Basin mustangs. This is necessarily tempered by the reality of what I think BLM is most likely to accept. First, there are currently NO horses outside Spring Creek Basin, so I think this is formal language “just in case.” In 2007, several horses were outside the herd management area. One was moved into the herd area from private property and remains – David. One currently serves with the U.S. Border Patrol on the U.S.-Canada border from Washington state – Justice. (If you’ll allow me some pride … Justice also was one of the 10 Border Patrol mustangs that marched in President Obama’s inauguration parade – just 18 months after he was captured. (An FYI – he was aged at 10 by the contractors – and ripe for removal, no questions asked – but at Canon City, he was determined to be no older than 5.)) And about four horses were captured outside the southwest end of the basin. Second, my strategy for “selective removal” is genetics-first – because I KNOW quite a bit of the genetics, especially of the adoptable-age horses. BLM goes with age because that’s what it knows (based on the contractor’s expertise in aging by teeth … which wasn’t all that great in 2007, as it turned out (even according to BLM)). Third … which is related to second … is that I’ll be looking at a combination of genetics AND ages – especially as it relates to “adoptability” – or the fact that horses between the ages of 1 and 4 are most likely to be *offered* for adoption – especially locally, immediately after the roundup. I will NOT make public the horses on the lists that I have given BLM, but these are the categories: STAY (I will say that Traveler and the introduced horses, at least, are on this list), should stay, can go, can go or can stay. This idea of having multiple lists came from Matt Dillon of the Pryor Mountain herd, to allow flexibility, and I think it’s excellent, so I adopted it (Matt has been a great inspiration over the years in many ways). Necessarily, maybe, the “can go or can stay” category has the most names. *** Please (I really beg you), don’t appeal to me for your favorite horse(s). As important as I believe this duty to be, and as absolutely grateful as I am to our local BLM folks who have afforded me this opportunity, it’s going to just about kill me to make these decisions. I am trying to make decisions that I can defend logically, that BLM will accept and that will benefit the herd as a whole. Please, please do not make it any harder. BLM says about half the horses rounded up will be offered for adoption and about half will be sent to Canon City. (Horses CAN be adopted from Canon City, and people can request halter (and saddle) training by inmates at the Canon City facility, to then be transported to the adopter’s home.) Realistically, this will depend on the number and make-up of the horses actually captured and removed. 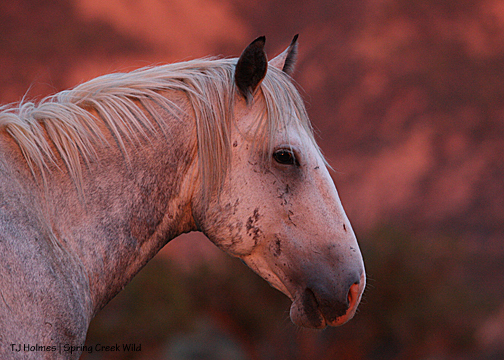 BLM’s rationale for the half-half deal is that in 2007, only about 13 of the 32 available horses were adopted. As BLM says, it’s a bad economy, the horse market in general is in the tank, and the mustang-adoption market itself is down considerably from happier times. 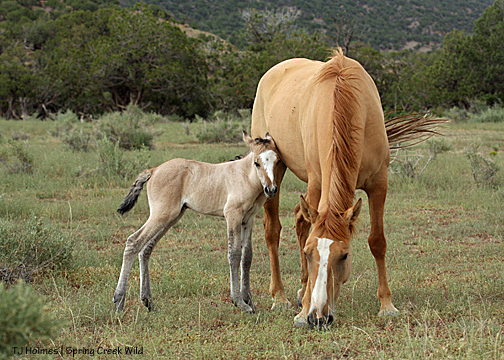 But here’s “the rest of the (hi)story”: In 2006, BLM held a mustang adoption in Pagosa Springs, in southern Colorado, about 100 miles from the site of the 2007 adoption (it will be here again: Montezuma County Fairgrounds, on U.S. Highway 160 a few miles east of Cortez, Colo.). 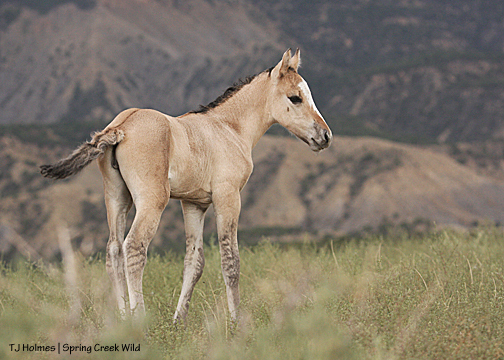 In 2005, a post-roundup adoption of Spring Creek Basin mustangs was held. So three adoptions in three years? That would tend to “saturate” even a bad market, yes? 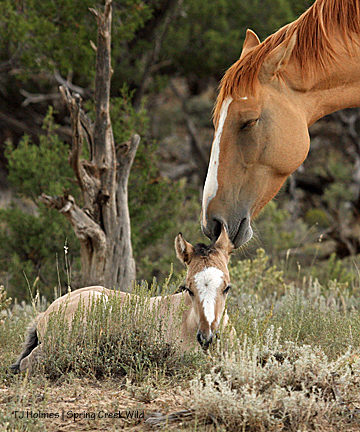 At the previous adoption – in 2000 – almost all the horses were adopted, according to NMA/CO memory. 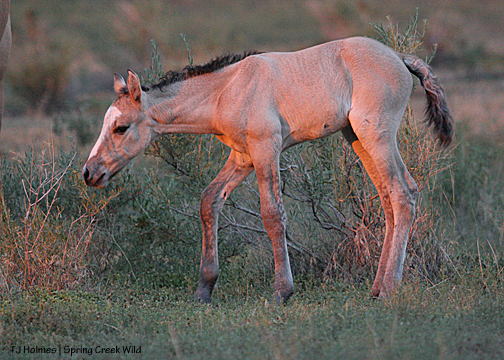 One of my goals for future sustainable management of this herd is to *create* a market for our Spring Creek Basin mustangs by making offerings somewhat “rare” – infrequent with few(er) horses. A BLM hot line will be available with information about the roundup: Tom Rice, associate manager of the Dolores Public Lands Office and deputy district ranger for the Dolores District of San Juan Public Lands, will update a message by about 10 p.m. each night about that day’s roundup activities. People can call that hot line at this number: (970) 882-6843 (his office number). The time will depend on the day’s activities and how soon he can get away to locate cell service. (Cell service within the basin – within the entire Disappointment Valley area – is bad at best. I have thought about trying to figure out a way to post updates to the blog through my cell phone, and if I have a strong enough signal, I will surely do so. I am almost positive I won’t be able to post any photos until I return to civilization, which likely won’t be until at least Monday (Sept. 19). I plan to be at the roundup every single day, until the last horse is gone, the last panel is loaded and the second-to-last human being (me being the last) has left his dust on the road. I’ll apologize in advance for being publicly incommunicado during that time, but honestly, I won’t be thinking about the blog a whole lot. I want to talk about observation for a minute. This is a little up in the air with regard to FAA rules about safety of people (and horses) with proximity to the helicopter. In 2007, observers were situated on the rim of Spring Creek Canyon, above the creekbed through which the horses run on the way to the pens, and on a hill “behind” the pens – the route of the horses brought them to the pens almost directly in front of this hill. Until BLM talks with the contractor and pilot, we won’t know for sure where observers can be, but BLM told us that as of now, they plan to allow observation from the hill as before but probably not from the top of the canyon. Local BLM has told us they are committed to transparency, and close observation such as this has been a great thing about roundups here in the past. Also, we have been told that in this age of “social media,” every/anyone can be considered a “journalist.” What that means in terms of the roundup is that media and public will be treated no differently. If the media can be in a spot, the public can be in that spot and vice versa. BLM public information specialists are working on a flier/brochure about roundup/visiting etiquette that will be given to observers upon entrance to the basin. This is important: THE BASIN WILL NOT BE CLOSED DURING THE ROUNDUP – unless there is a safety issue. First flights each morning will likely begin around 7 a.m.
Another word (or more) about safety: An APHIS (Animal and Plant Health Inspection Service) veterinarian will be onsite, a veterinarian with a clinic in San Miguel County (most of the basin is in San Miguel County) will draw blood for Coggins testing, and a local Montezuma County veterinarian (Dr. Sue Grabbe, who has been present at the last two or so roundups) will be onsite again at the request of NMA/CO to observe the roundup for safety of the horses. Finally, I promise to be candid about the event. I won’t defend BLM and/or the contractor if something “untoward” happens – and/or I’ll explain the event/why it happened (such as the mare that was mistakenly put in with the stallions in 2007) – but neither will I allow attacks via this blog on any of them for doing their jobs. 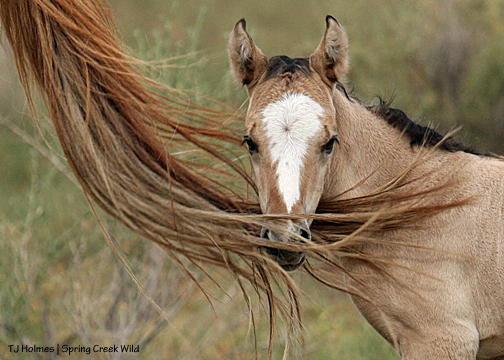 We – BLM and our own advocates – have made every effort to ensure this roundup runs as smoothly and as safely – for horses and for humans – as possible. This is going to be a difficult thing … but it’s something our groups have spent the last four years (specifically) working on to ensure that safety – and other management considerations such as fertility control implementation. Literally, we started almost immediately after the 2007 roundup. Nothing happens with government overnight, and it has taken every one of those years to get where we are now. We’re not done. We’re not going away. 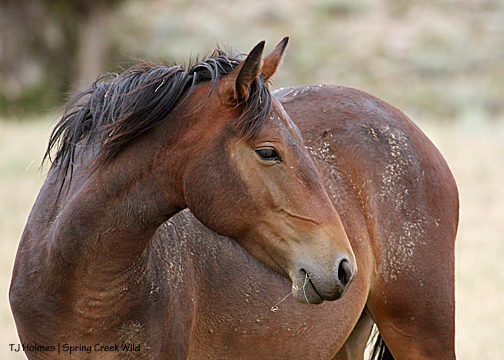 It will always remain the priority of the Disappointment Wild Bunch Partners (and each of our individual groups) to maintain the highest level of welfare for our Spring Creek Basin mustangs. Well, it turns out Julie was right! On Friday, Aug. 19, Kootenai was just days away from foaling! But Julie’s official guess was Sept. 1. Three guesses are close – Aug. 20 (Zacharias), Aug. 22 (Toppyrocks/Rachel) and Aug. 24 (Maria). I knew it was going to be tough! Speaking of tough – just try to resist that little face – do you see those lines above her eyes?? I have my guess as to her age, but to be as fair as possible, as promised, I have sent pictures to a local veterinarian to get a “professional opinion.” I’ll let you know what she thinks as soon as possible. In the meantime, I introduce to you our newest member of Spring Creek Basin! P.S. Volunteers and BLM met (in person and via conference call) yesterday at the Dolores Public Lands Office to talk about the roundup and adoption. 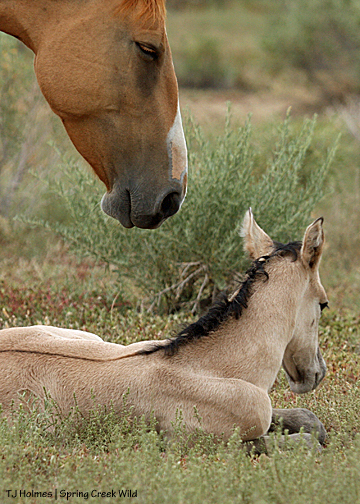 I will have more information in a separate post – including a phone number that you will be able to call for updates about each day of the roundup – but we did talk at length about the mares due to foal immediately (at the time, I did not know Kootenai had foaled, just that she was close) and that they will NOT be targeted for roundup/capture. This includes Kreacher’s band (Raven/Apollo and Kootenai and her new daughter), Seven’s band (Roja/Killian, Mona/foal due Sept. 15 and Mona’s yearling daughter, Shane) and Ty’s band (Chipeta – due Sept. 1 – and her yearling daughter, Puzzle). Just something I like about this photo … I can’t remember whose tail that is flashing through the image, and I don’t have any supporting photos to indicate who it was. I suspect it’s someone in Hollywood’s band because they were in front of me when Kestrel’s band came up the hill behind them. It reminds me, maybe, that life is fleeting … not always clear of distraction … that I don’t have all the answers … that even with all of that, life is beautiful and meaningful and meant to be enjoyed.